Okay...I think it's finally time for this. I'm ALWAYS talking about making sauce on Sunday's. I guess it's about time I share the recipe with you all. The only reason I have been holding out is because I literally NEVER make it the same way twice. However, I think I've done it enough times that it is safe to share the basics! The last time I made it, I took note of all of my measurements...and since I was VERY pleased with how that particular batch came out, it is the winning version that I will share! Not only do I find this sauce delicious, I also love making it. It smells so good cooking low and slow! There is nothing like a traditional Sunday Sauce (or gravy....if that's what your family calls it)! 1. In a large pot, brown ground chuck and then remove. 2. Next heat up about a Tbsp. of olive oil and brown the sausage on all sides. You don't need to cook it throughout, just let the outside get nice and golden brown and then remove from the pot. 3. Add another Tbsp. of olive oil to the pot, lower the heat to medium and sauté the onions for about 4-5 minutes until translucent. Next, add the garlic, carrots, and cook for another 2-3 minutes. 4. Add the meat back into the pot, and red wine, cook for about 4 minutes until wine starts to reduce. 5. Add the three cans of tomato puree, Mrs. Dash, salt, and pepper. *Don't waste the rest of the puree in the cans. I filled each can about 1/4 of the way with water, gently rinsing sauce off the edges then added to the sauce. 6. Stir sauce thouroughly, after it starts to bubble lower the heat to a simmer. Cook for about 4 hours stirring every 15-20 minutes or so. Make sure to stir from the bottom up, making sure nothing is burning to the bottom of the pot. 7. When it is finished cooking, add the parmesan cheese, and basil - stir. Serve with your favorite pasta. Top with extra parmesan cheese, and basil! ENJOY! Looks yummy...can you use turkey sausage or do you need the fat? Pinned it! Absolutely!!! I haven't tried it, but I am sure it's good...let me know what you think! I bet it's delish!! I love turkey sausage! I would use italian flavored probably. I obviously highly recommend...and it smells like Sundays when it is cooking!!! YUM! ok PERFECT - i'm constantly on the look out for a go-to sauce recipe! thanks chick! 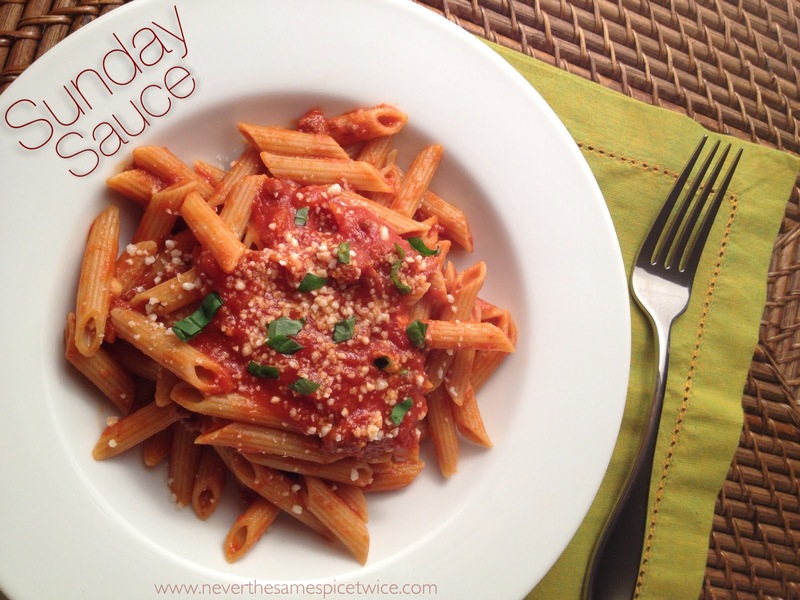 I def consider this a "go to" recipe...hope you love it! I love how you wrote the title on the cute bowl so creative! love this recipe!!! the carrots and a CUP! of wine..thank you! !